There is a certain mystique to the notion of a log shelter or cabin, thanks in part to popular culture and folklore. It's completely possible to build a primitive log cabin for use as a lakeside or hunting getaway. Cabins also make excellent playhouses for children. 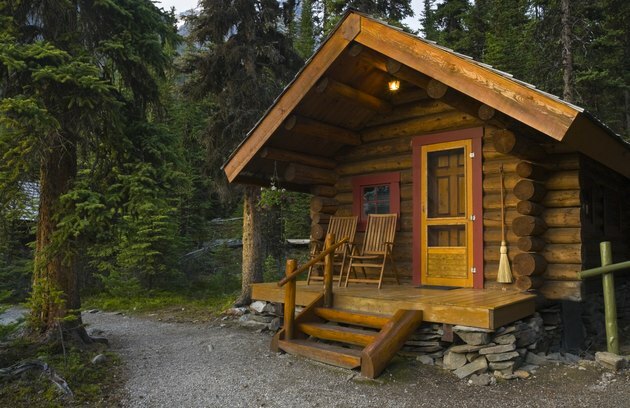 With a supply logs and some basic tools, your dreams of building a cabin can become a reality. Before you begin, you'll need to clear a space for your forest log cabin. Remove all trees, rocks and debris. Ideally, you should situate the structure on even ground and in a place with good drainage. If you'll be using power tools to construct your cabin, be sure you are familiar with their safety precautions. Hearing and eye protection is also a must, as are heavy-duty gloves when dealing with logs or lumber. Let those around you know that you'll be undertaking a construction project so that they don't interfere or injure themselves accidentally. You may require the assistance of another adult for lifting heavy logs. First, you should decide how large you'd like your cabin to be. Use a chalk outline or stakes with string to map out on your site where you plan to build. Based on the length and width of this floor plan, you can begin to determine how much lumber or logs you will need for the floor. Multiply the length times the width to get the area of the cabin's base. Next, decide how tall you'd like your cabin to be. Multiply this height by the width of each side to determine the logs you'll need for the walls. Depending on the size of the logs or lumber you'll be using, you may require a different number of each. Start by laying two logs parallel to one another atop your chalk outline or staked area. Use a saw or ax to cut notches in the top of each near but not quite at the ends. This notch should be large enough to rest another log. Then, place two more logs perpendicular to the first to so that you have formed a square or rectangle. If you are building a floor, you can construct it at this point. Fill the base you have created with logs or lumber, nailing them to the sides of the base as you. If you will be leaving the floor of the cabin as is, you can continue building the walls instead. Keep laying notched logs atop one another in pairs so that you are always placing the same two sides first. When you reach the height at which you'd like your doors or windows to be situated, you'll need to use a saw to cut openings. Then, continue placing logs as you were before. To make a roof, place logs with notches on either end face down in a tightly packed row so that they completely cover the entire area of the cabin. You can use thatch, clay or other materials to fill in gaps between the logs. Depending on how primitive you want your cabin to be, you may also consider other roofing materials. If you choose, you may use clay and thatch to fill in the gaps between the logs of the cabin walls, too. How Many Logs are Needed to Build a Log Cabin?